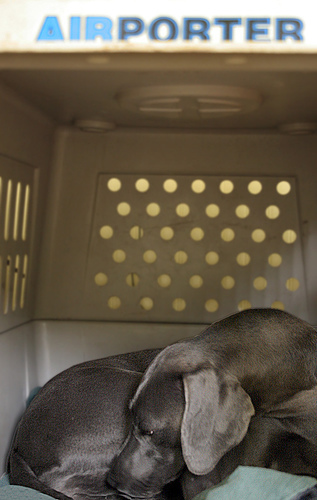 A pet hurricane preparedness kit will help to make sure that your Weimaraner is cared for during an emergency, and is not abandoned or neglected, because of unfortunate circumstances. When you are faced with an emergency like a hurricane or flood, where you have to leave your home for safety, you will want to take your dog with you. 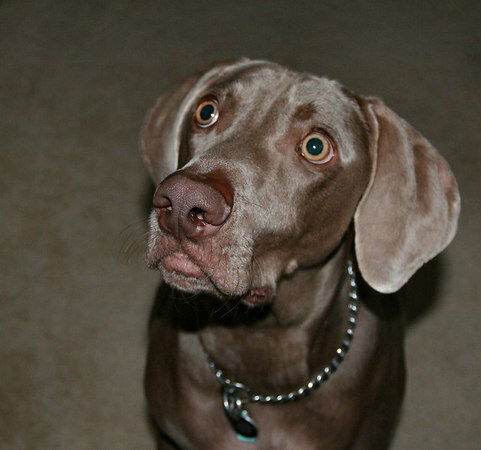 Weimaraners do not fare well alone, especially during a frightening super storm with heavy winds and strange noises. They can be skittish, under the best of circumstances. Pack Supplies for Your Dog BEFORE an Emergency! In the last minute rush of gathering family members and making sure that your home is secure, that you have everything that you will need in the shelter or hotel, and that loved ones have been notified where you will be—it’s easy to forget your best friend, your pet! Think ahead, get ready for an evacuation and make sure that your dog or cat will be in good hands. Your pet hurricane preparedness kit should include a travel pen or crate. While you can put together your own hurricane preparedness kit for your pets, you might prefer to purchase an emergency preparedness kit put together by veterinarians and animal groups, and just keep it on hand, in case you need it. Remember that stores may not be open for weeks, and you may have to do some camping for awhile, until your home is repaired or you are allowed to return to your neighborhood. Dog Food – Hopefully you won’t be away from your home for very long, but you should make sure that your dog has at least a week’s worth of food. Using your dog’s own food is best, as dogs can have difficulty switching dog foods. But, in an emergency, any food is better than no food! Water – Just like you, your dog will need water during an emergency. Make sure he has at least a week’s worth of water. You might also consider Water Treatment Tablets as well, just in case. Travel Dishes – Include a dish for water and one for food. Unbreakable dishes are best, and Dog Travel Bowl works especially well. Medications – If your dog takes medications, make sure you pack enough for at least a week. You might want to keep more than that on hand, in case you are unable to get a prescription filled or get to the store.If your dog gets excited and nervous during storms or when she is near a lot of people, consider a natural calming product like Elite Dog Calm. I use Elite Dog Calm with my dog, Skipper when she gets groomed, as she dislikes grooming intensely and gets very nervous. 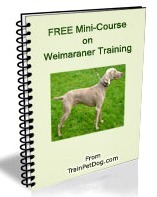 If your Weimaraner is nervous around people and crowds, you might also consider using a Thundershirt Dog Anxiety Treatment Wrap. While this seems odd to many people, a snug wrap like this one is actually used in therapy treatment for people—and it does work! Leash – No matter where you take your dog, you will be expected to keep her under control—that means taking her leash, and a muzzle, if that is necessary. Travel Crate – A travel pen or folding crate is a way to give your dog a safe hideaway and a place that is his, exclusively. Include a pillow or blanket to make it more comfortable. Collar with ID – Your dog should have a Pet ID Tag on already, but, if she doesn’t, make sure she can be identified, if she is separated from you. Some people choose to have a microchip embedded in their pet’s shoulder. Health records – You may be asked to produce these, so have them ready. Toys – Don’t go overboard here, but do make sure that your pet has a few toys and perhaps a chew, to keep him occupied and make sure he’s not bored. These should be for quiet play, not running and chasing toys like Frisbees. Dog Treats – Everyone needs a treat, once in awhile. Waste Pick-Up Bags – for cleanup. Disinfectant and paper towels – for cleanup. Dishwashing soap and dishcloth – to clean the dishes. Hand cleaner – for your hands, in case they become soiled. Putting together your own a pet hurricane preparedness kit will take a little time, but being prepared will help keep your pet safe and healthy—and your pet and family together! Let’s leave no dog behind!